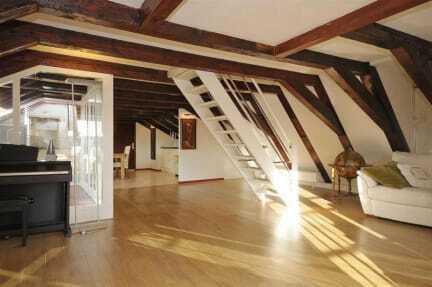 Loft Gallery Amsterdam are offering spacious rooms with views. Recently renovated, clean and quiet place to stay. Chill on a roof terrace, use free Wi-Fi or guests common room with kitchen facilities. We offer double rooms. Friendly and multi-language-speaking staff will offer you a free map and be glad to answer all your questions and will help you with everything. Our place is recommended for people between the ages of 16 and 35 years old. Please be advised that we don't have an elevator. We will be glad to store your luggage before the check-in time and after check-out time. I can really recommend this place! nice tiny rooms. it is very clean. There is also a balcony where you can sit and ejoy the view and the sun. We really enjoyed our stay (3 nights): The kitchen is equipped with everything you need for a quick meal. To get to the 6th floor you have to climb many stairs but that belongs to the atmosphere of Amsterdam´' s beautiful small houses. Our room had a roof window without blinds but the light didn´ t disturb us. The view was great (window and terrace) and the room quiet. The shared bathroom with 4 other rooms wasn't a problem. Unfortunately the heater didn't work well so the room was quite cold. Nice place to stay if you don´t mind the 70 steps. Light big kitchen with 2 fridges to share with 5 rooms and a cute roof terrace. The bath is to share with 3 rooms which was ok but very narrow steps to reach it. Only one towel per person and nothing in the kitchen or the bathroom to dry the dishes or your hands (but a dishwasher), no glasses to drink but cups. There was enough space in the room and but more furniture like a cupboard or a lamp at the bed would improve the comfort. It was a nice stay at Loft Gallery. 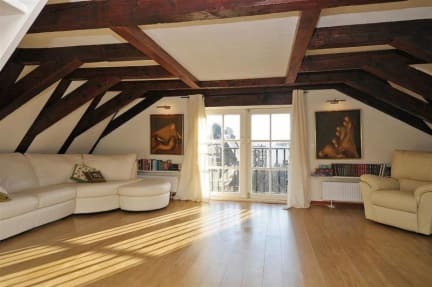 Rooms were as pictured and location was just perfect. There were towels and bed linen provided and basic kitchen stuff. Only negative thing is the fact that there is only one bathroom (and toilet) for 5 rooms / 10 guests.